This weeks case of the week deals with a dog that was urinating all over the house uncontrollably. Mia is a 6 year old female, Yorkie mix who for the past couple weeks, has been urinating small amounts all over the house. The urine had blood in it, but was a very small volume of urine. When Mia first arrived, a urinary tract infection was suspected. Urine was collected to submit for analysis. During the examination, Mia’s abdomen was palpated and a large firm mass was felt near her bladder. This prompted x-rays to be taken of Mia’s abdomen. The x-ray showed some very concerning things as you can see in the pictures. 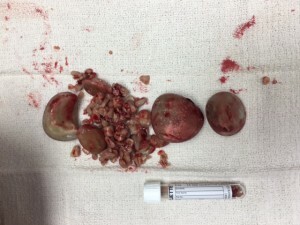 Mia’s entire bladder was filled with bladder stones! The results were discussed with the owners and surgery, was recommended. A surgery to remove the bladder stones was performed later that day. This surgery is called a cystotomy. in the hospital for the night and went home the next day. She is now urinating normally after surgery, a round of antibiotics, and a diet change to help with urinary health. Urinary issues can sometimes be much more severe than originally thought. If your pet is having urinary issues, this warrants a visit to your veterinarian.